Mount Kinabalu’s specialty lies in its location at a renowned World Heritage Site—Kinabalu Park. Nature lovers will be delighted to be able to witness the many variations of flora and fauna that are to be found on the mountain at different altitudes. 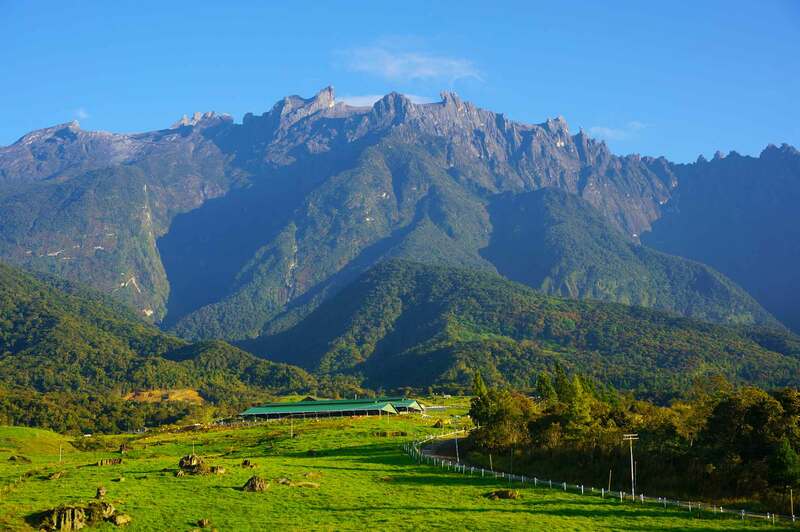 Mount Kinabalu, along with other upland areas of the Crocker Range is well-known worldwide for its tremendous botanical and biological species biodiversity with plants of Himalayan, Australasian, and Indo-Malayan origin. A recent botanical survey of the mountain estimated a staggering 5,000 to 6,000 plant species (excluding mosses and liverworts but including ferns), which is more than all of Europe and North America (excluding tropical regions of Mexico) combined. It is therefore one of the world’s most important biological sites. Standing majestically at 4,095m (13,435 feet above sea level), Mount Kinabalu is the highest mountain between the Himalayas and New Guinea. Mount Kinabalu derives its name from the Kadazan word, ‘Aki Nabalu’, meaning ‘the revered place of the dead’. It is one of the safest and most conquerable peaks in the world—provided that you’re reasonably healthy and physically fit. Mount Kinabalu (Gunung Kinabalu) is the most dramatic feature in Sabah and the tallest peak between the Himalayas & the New Guinea. Towering at 4,095 metres (13,435 feet), Mount Kinabalu exerts a magical quality that is both indescribable and unbelievable. The granite peaks are constantly veiled in wisps of clouds and at times during a clear day, the summit reveals a distinct glacier carved pinnacles, rising from the smooth granite dome. It is one of the safest and most conquerable peaks in the world—provided that you’re reasonably healthy and physically fit. Mount Kinabalu, along with other upland areas of the Crocker Range, is well-known worldwide for its tremendous botanical and biological species biodiversity with plants of Himalayan, Australasian, and Indo-Malayan origin. A recent botanical survey of the mountain estimated a staggering 5,000 to 6,000 plant species (excluding mosses and liverworts but including ferns), which is more than all of Europe and North America (excluding tropical regions of Mexico) combined. It is therefore one of the world’s most important biological sites. The mountain itself represents one of the world’s youngest batholiths: an old magna chamber that was forced through the earth’s crust. It is important to make reservations beforehand and as early as possible. The Mount Kinabalu Summit Trail is a very popular activity; and daily permits run out months before already. It is not an easy climb, but you will always have the beautiful memories of this amazing adventure. Mount Kinabalu is a relatively easy mountain to climb compared to many other mountains world wide; it is known to be one of the most accessible mountains in the world. To reach the summit you do not have to be in extremely good shape. People with physical limitations however, should not climb the mountain without consulting a physician first. If you are not an experienced climber; then you could consider a different route (Timpohon Trail) that is less strenuous. Yearly, over 20,000 people climb the mountain. The best time of the year to climb the mountain is between April and August. If you have opportunity to time your trip; do it so that you climb the mountain during full moon as then it is lighter at night when you do the final ascent. Everyone who wants to go mountaineering at Mt. Kinabalu is advised (obligated!) to use a mountain guide. Especially at the summit the guide can be very helpful (the last part is quite hard). The guide will be waiting for you at the Park HQ. If you arrange your trip via an agent or travel organization; the mountain guide will automatically be part of the package. A typical climb starts very early in the morning. It is wise to start as early as possible. The longer your body can adjust to the height at base camp Laban Rata, the better chances you have of reaching the summit for one of the most spectacular sunrises in your life. Many people that start too late, have to give up eventually due to altitude sickness. Of our group almost 30 people didn't make it to the summit for various reasons. We got up at 5.00 to have a quick breakfast and were ready to leave at 5.30 in the morning for the 1,5 hour drive from Kota Kinabalu to the park entrance. We started our climb at Timpohon Gateat 8.30am on a Thursday morning, we arrived at Laban Rata Rest House around 12.30 (3278 meters). We had a drink and a meal and went to bed immediately after that. The atmosphere at the base camp was almost surreal. Every now and then new people arrived. Some were absolutely exhausted; others just started to play some soccer. Some were dead tired gazing into the clouds (it was very cloudy at Laban Rata that day and it even rained a bit at the end of the day); others were playing cards. Food is quite expensive at Laban Rata, it would be wise to bring your own snacks. We booked a private room, which was great for a good sleep. As there not many private rooms at Laban Rata Rest House, be sure to make your reservations as far ahead of the actual summit trail as possible (as in months ahead). We were woken up at 0.30 the following night. We were lucky as we had clear weather that night. We were warned before we went to bed that the final stage of the climb might be cancelled due to the bad weather (this is always a risk during your summit trail), but luckily the weather changed after nightfall. We left at 1.00 am for the last part of our climb. This was the best part; pitch dark, slippery...amazing views. It was quite cold during these last hours; though the temperature didn't go below freezing point. We managed to get two jackets at Laban Rata (yes; we were dumb enough only to wear a long sleeved shirt), and those were real lifesavers. The last part is almost like walking on the moon, the only animals we encountered were numerous small mountain rats. We arrived at the summit at 5.30; just in time to see the sun rise over Southern Asia. This was one of the best sunrises ever experienced; really a memory of a lifetime. Then started the most difficult part of the climb as the way down was perhaps even more strenuous then going up the mountain. The constant hammering on the knees really hurt, but in the end we made it back in one piece; partly thanks to our guide. To us it was a really amazing adventure. We were in ok physical shape, but did go through some rough moments. Some tell us after climbing Mount Kinabalu that they found it to be 'a piece of cake’; others agreed with us that it was really an achievement to reach the summit after all the hardships. I know that some of the toughest guys actually didn't make it to the top. It will not amaze readers that these were the same guys that played some friendly soccer after arriving at Laban Rata (instead of relaxing and acclimatizing at such heights).